MR34-37 Records of Webcast on New Features in PortaSwitch. Do I need extra PortaSIP® servers to implement the high-availability PortaSIP® cluster? You will need a number of servers equal to the total number of all PortaSIP nodes: both dispatching and processing. So, to do an example deployment as shown in the diagram below you will need 5 servers. You can choose which physical servers will run the PortaSIP® dispatching nodes, and on which PortaSIP® processing nodes. You should not mix dispatching and processing nodes on the same physical server in a production environment with real-life load. Your existing PortaSIP® license can be used to run either type of node. You only need additional PortaSIP® servers if your current total number of PortaSIP® servers is not sufficient to build a high-availability configuration. Please feel free to contact us, and together with our PortaOne engineers we will determine the optimal high-availability network configuration and whether any extra servers are required. The new PortaSIP® cluster architecture - in which release is it available? The improved PortaSIP® cluster is already available as part of release MR37. You are welcome to contact the PortaOne support team to schedule an update. In which product bundles (e.g. regular PortaSwitch® or PortaSwitch® Procinctus) is the PortaSIP® cluster functionality available? All PortaSIP® licenses are equal. :) Cluster functionality will become available on your system after making an upgrade to release MR37 for any product combination you originally purchased. The only thing to consider for a smaller system would be the total number of PortaSIP® servers - i.e. with a standard PortaSwitch® and only one PortaSIP® server available, you can hardly build a cluster. Please refer to the previous question regarding the total number of servers. In the current version of PortaSIP® cluster, how will the RTP stream flow? The RTP stream flow will be controlled by the processing PortaSIP® nodes. RTP stream will either be directly connected between end-points (a typical case for SIP trunking) or may be proxied via the processing node (if customer / vendor settings require RTP proxying). The RTP stream will not go via a dispatching node, so you do not have to worry about "bandwidth choke" there. When large numbers of customers take advantage of the attractive upgrade offer that will be presented in the coming months and convert to PortaBilling® Oracularius, what will happen to the MySQL version of PortaBilling®? Do you plan to phase it out in the future? We will continue developing, selling and supporting both products. The MySQL-based PortaBilling® fits very well with start-up service providers, where high availability is not necessary to support their operations. While we think that from a business growth perspective it is better to start with a high-availability platform from day 1, we understand that some companies prefer to do an initial service launch using a smaller platform. And we want to give them the chance to do so. For video conferencing, which codecs are supported? In order to use the on-screen conference menu the h.264 video codec should be used. Can a single server already running the PortaBilling® RADIUS billing engine also process Diameter requests – or does the Diameter server require a separate physical server? 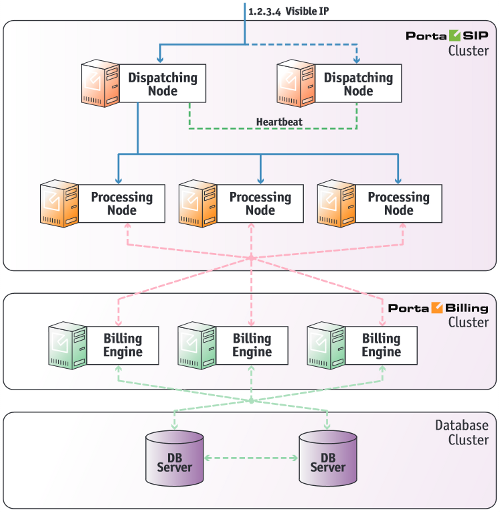 The billing engine in PortaBilling® is converged, so the same application handles various types of requests. And yes, you can use the same PortaBilling® server to process both RADIUS and Diameter requests. What is the current status for SMS services authorization / ratings and do you support message transfer protocols such as SMPP? PortaBilling® can already be used to perform authorization and charging for SMS messages. In order to allow service providers to offer SMS services (such as instant messaging to mobile users, premium number SMS, SMS campaigns and wholesale SMS) while using an all-IP infrastructure, we have added native support of the SMPP protocol within PortaSIP®. We are currently doing interop tests with various vendors of SMPP gateways and will make that functionality available for the general public in release MR38 (December 2013). How do high-availability options relate to the PortaSwitch® site redundancy functionality announced earlier this year? Do we need one or another, or both? These two solutions complement each other. For instance, if you have a high-availability main site in city A, but also a substantial number of customers in city B - in the case that a connectivity link between the two cities is broken, customers in city B would not be able to use the service. Having a redundant site in that city (or cities) would definitely help. Also, it would protect you from that rare (but unfortunately possible) event such as a total outage of the main site’s hosting facility because of an electricity black-out. Another very important advantage of having a secondary site is the ability to perform zero down-time upgrades. So, for example, while your main system is being updated to a new release, the service is continuing to be provided using the secondary site. This allows you to offer the latest set of features to your customers while meeting your SLAs regarding high availability. For how long will the special conditions for upgrading to PortaBilling® Oracularius be available? This offer is only available until December 22nd, 2013.